A key question is whether the talks in Cairo will give Hamas, which the United States designates as a terrorist organization, influence over a consolidated Palestinian government of both the West Bank and Gaza Strip — and how much. The United States envoy, Jason D. Greenblatt, warned before his one-day trip to Cairo that any Palestinian government “must unambiguously and explicitly commit” to nonviolence, peaceful negotiations, recognition of the State of Israel and acceptance of previous agreements and obligations — including to disarm terrorists. “If Hamas is to play any role in a Palestinian government, it must accept these basic requirements,” Mr. Greenblatt said. Israel and the United States both would welcome Mr. Abbas’s regaining control of Gaza, if only to avert what aid groups and the United Nations had called an emerging humanitarian and health crisis, as disease spread and the pumping of raw sewage into the Mediterranean began to disrupt water plants along Israel’s own coast. The Rafah border crossing with Egypt on Monday. An Oct. 12 agreement calls for Hamas to give the Palestinian Authority control of the crossing. For Egypt, the motivation for brokering the talks goes well beyond the good will derived from diplomacy. 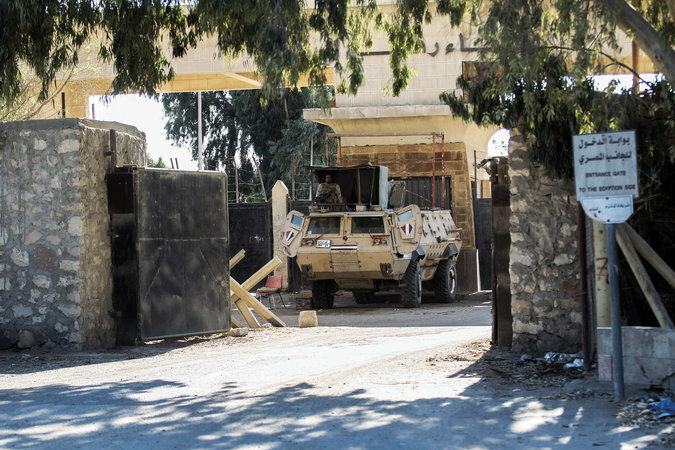 The Egyptians are eager to secure the Rafah border as part of a broader effort to halt weapons smuggling into Sinai, where they are fighting an Islamic State affiliate. But while a rapprochement between Hamas and Mr. Abbas’s Fatah faction, which dominates the Palestinian Authority, poses the tantalizing prospect of a united Palestinian front facing Israel in potential peace talks, a unity government involving Hamas could violate congressional rules against funding terrorist organizations. That, in turn, could cause the Trump administration to withhold hundreds of millions of dollars in annual aid to the Palestinians. A similar deal between Hamas and the Palestinian Authority in 2011 prompted threatened funding cuts. Notably, Israeli statements on the Palestinian reconciliation effort, including Mr. Netanyahu’s latest, appear to leave narrow but perceptible wiggle room for reaching an accommodation. Mr. Netanyahu’s vow not to “conduct negotiations with a terrorist organization” ignored that Israel had done precisely that a quarter century ago. In 1993, Israel reached a historic agreement with the Palestine Liberation Organization, which Israel had long considered a terrorist group, and which, unlike the Palestinian Authority, remains its official negotiating partner. Under the reconciliation effort, the Palestinian Authority’s ministers who are resuming their functions in Gaza are technocrats who were installed as part of a 2014 national consensus government, to which Israel and the United States do not object, given that the ministers include no Hamas members. This time around, Hamas has so far refused to consider disarming its fighters and has insisted that it remains dedicated to liberating Palestine, not embracing Mr. Abbas’s project of a two-state solution — despite a new document of principles it released in the spring that accepted the idea of a provisional Palestinian state, without renouncing future claims to the land that is now Israel. “No one can disarm us,” he added. Still, Mr. Greenblatt’s presence in Egypt on Thursday suggested that the United States sees the Fatah-Hamas talks as a chance, however slim, to at least move Hamas in the direction of disarming and embracing the peace process. The militant stance by Hamas leaders poses a problem not only for Israel and the United States, but also for Mr. Abbas, who has vowed not to let Gaza morph into a Lebanon-like situation, where, like Hezbollah, Hamas’s heavily armed fighters wield the ultimate veto power over an enfeebled civilian government that bears responsibility for the difficult work of delivering public services.